An outbreak of Ebola virus disease is worsening in the Democratic Republic of the Congo, and health workers are racing to vaccinate those at highest risk with an experimental vaccine. They’re also mobilizing to try to stop any further spread. The virus, which usually infects people living in deeply forested areas, has turned up in the busy river port city of Mbandaka. “The confirmed case in Mbandaka, a large urban center located on major national and international rivers, roads and domestic air routes, increases the risk of spread within the Democratic Republic of the Congo and to neighboring countries,” the World Health Organization said Wednesday. WHO says 58 confirmed or suspected cases are reported, with 27 deaths, making for a fatality rate of 47 percent. And officials had a moment of panic when they learned two patients left the hospital in Mbandaka on Monday night. One died at home the next day and was buried with the help of medical charity Medecins Sans Frontieres (MSF). The other was sent back to hospital and died that night, WHO's spokesman in Congo, Eugene Kabambi, told Reuters. Ebola spreads quickest to people caring for the sick without proper protective gear, and can spread at funerals when groups of people wash and handle the bodies of the dead. 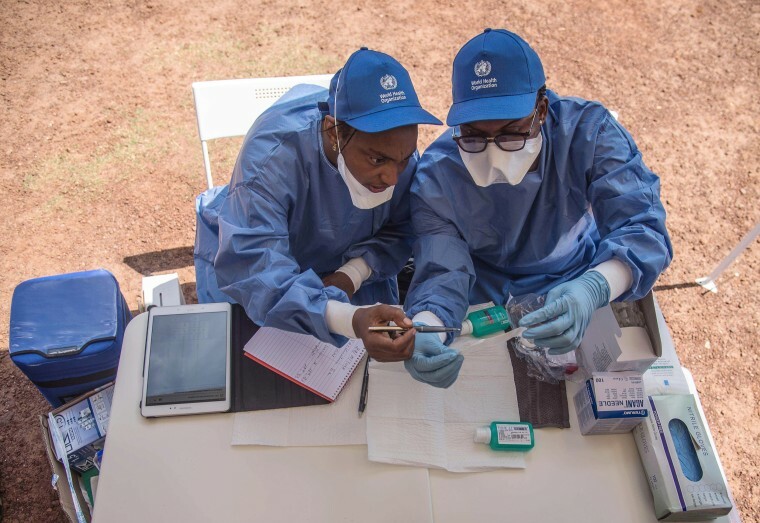 WHO has cautioned nine neighboring countries to be on high alert for cases and says people leaving the Democratic Republic of the Congo (DRC) should be screened for disease. “The highest priority countries at risk are the Central African Republic and the Republic of the Congo (Congo-Brazzaville), due to their proximity to the current event,” WHO said. Where is the most likely international spread of Ebola? The EcoHealth Alliance analyzed flight patterns from airports in the region. The DRC is a former Belgian colony, and so has frequent connections to Brussels, while the Republic of the Congo, also known as Congo-Brazzaville, is a former French colony and thus has connections with France. “No American cities rank within the top 20,” the nonprofit group, which focuses on emerging diseases, said. In the 2014-2016 Ebola epidemic, only a single traveler accidentally carried Ebola to the U.S. He was Thomas Eric Duncan, a Liberia citizen visitng family in Dallas. He died, and two nurses who treated him became infected but recovered. Other Ebola patients treated in the U.S. were health workers and one journalist who were transported for treatment under careful conditions after they were diagnosed. Fewer than 1 percent of travelers from the Congo region head to the U.S., the group said. New York, Miami, Atlanta, Boston and Los Angeles are the likeliest U.S. cities to get passengers from the region. While the worries about spread are high, health experts say this outbreak is not likely to be as bad as the 2014-2016 Ebola epidemic that killed 11,000 people in Liberia, Sierra Leone and Guinea. That’s because the DRC has fewer international connections. “One of the things that made West Africa such a perfect storm was that … it happened where there was tremendous activity among people,” said Dr. Jonathan Epstein, a veterinarian and epidemiologist at EcoHealth Alliance in New York. Ebola spreads by very close person-to-person contact and is usually only transmitted when a patient is already showing symptoms, so the virus wouldn't spread as fast as influenza or measles can. In the Congo area, roads and airfields are fewer. “The infrastructure in the Democratic Republic of the Congo is not as good,” Epstein said. The initial cases were in a very remote area and travel to the busy capital, Kinshasa, is difficult. However Mbandaka has an airport, sits on a river and is near porous borders. That's why even one case there is worrisome. “Hopefully this will be contained so cases don’t get to Kinshasa,” Epstein said. Airports there and in neighboring Brazzaville could allow people to travel far and fast. The incubation period for Ebola is anywhere between two and 21 days, so people can travel before they show symptoms. “With approximately half a million passengers traveling from the Democratic Republic of Congo each year, the disease requires just one infected traveler to cause a global public health emergency, and this helps us be forewarned and prepared,” said Dr. Peter Daszak, president of EcoHealth Alliance. But preparations in the DRC have been better than in West Africa. Ebola had never been seen in West Africa before. Congolese authorities are used to it. The virus was discovered in the country in 1976, when it was called Zaire. “The response to this outbreak both by Congolese and the international community has been better and resources have hit the ground quicker,” Epstein said. The U.S. has pledged at least $8 million to help and WHO is deploying vaccines. Merck, the vaccine maker, has sent 8,600 doses with 8,000 more coming, WHO said.